CENTERVILLE, Calif. (KFSN) -- It's a sign you can't miss when driving down Highway 180 through Centerville. More often than not, an inspirational or religious message is displayed in bold white letters against a blue background. 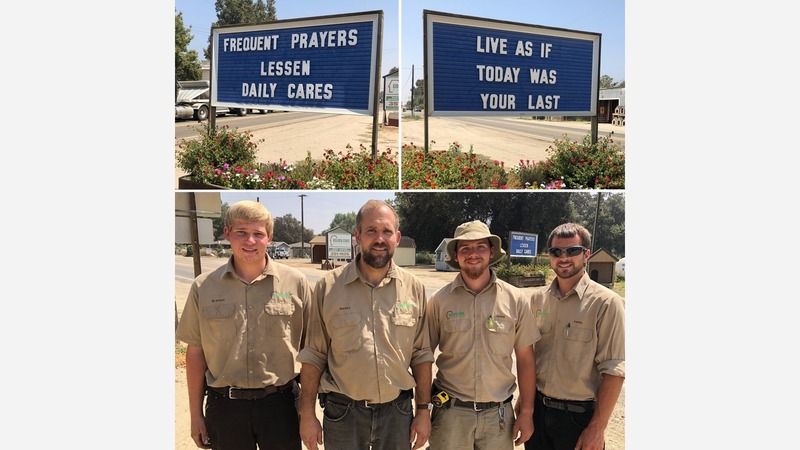 This week, one side says "Frequent prayers lessen daily cares," while the other side reads "Live as if today was your last." The owners of shed and garage maker Golden State Buildings, first put it up when they started business there about 16 years ago. "It's interesting in business," said co-owner Wesley Weaver. "This is something I've learned recently. That if making money is our final goal, after a while, it's not gonna work. We have to have something else, something that's more than making money. You know serving God, serving the community, doing good for somebody else, at least taking care of my family. But if all it is is just making money, it's gonna be short served, it's not gonna work." They first started putting up promotional deals, but after running out of ideas, they decided to try Biblical messages. Ever since they noticed a difference in the number of people dropping in to chat. "There's more people that stop whenever there's a religious message on there than say hey they want the free paint or they want the free window or whatever," Weaver said. As a Christian, he says it's important to put display these types of messages. "Number one because I believe it. Number two. I think people are seeking, people need it, want that message. It's just like some other things, if it's true, then why aren't you gonna talk about it?" This will continue even with changes coming from the Highway 180 extension being constructed behind the business. They say they plan on turning the back into the new front, therefore all of their displays - including the sign - will just be relocated.